One of the things Lesley and I were most anticipating when we were preparing for our recent trip to Mexico was a chance to dive in cenotes. Cenotes are openings to underground rivers with caves, rooms, and passageways that form when an area of the roof over the underground river collapses. The cenote I was most looking forward to diving was one called Angelita. This site is a sinkhole with some very weird things going on which feel so surreal when diving it. After a drive out of town and a turn that led us on a road through the jungle we pulled up to a dirt lot that had a wooden sign painted with “Cenote Angilita”. Part of the dive briefing included a walk to the dive site along a little trail cut through the jungle. During the walk the guide pointed out an oregano tree, gum tree, and lemon trees. The trail wound around to a flat rock that looked down over the sinkhole Angelita. After the site briefing we geared up to dive. We walked up to the same flat stone, held onto our fins, and did a 15 ft / 4.5 m giant stride down into the water, grouped up and started our descent. 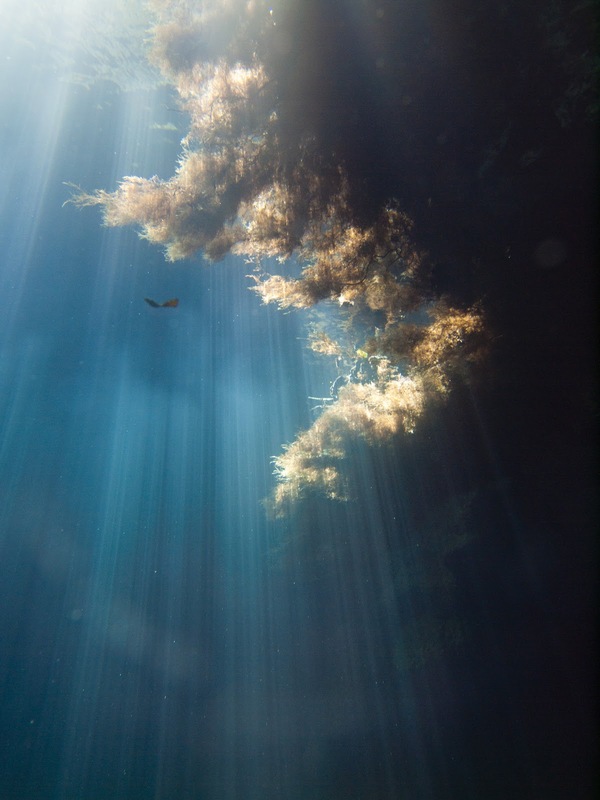 Looking down from the surface you have the same perspective as you do with blue water diving – the light rays dancing through the clear blue water. Descending down you could look around 360 degrees and see that you were diving in a huge limestone cylinder. What looked like the bottom came into view soon after we started our descent. There was a pile of rotting leaves and tree limbs surrounded by a reddish-brown liquid. It gave me the sense that I was floating in the air above a river with a shore made of trees and a dirt area with tree limbs, not that I was 100 ft / 30m underwater diving around broken tree limbs and piles of leaves. The red-brown area is actually a hydrogen sulphide acid layer that looks like a flowing river. Once we got our bearings, our guide signaled us over to the safe area for us to descend through the acid layer. We grouped up in a circle holding on to each other and descended through a yellow rust color layer where the visibility dropped to zero and the smell of rotten eggs drifted into your mask. 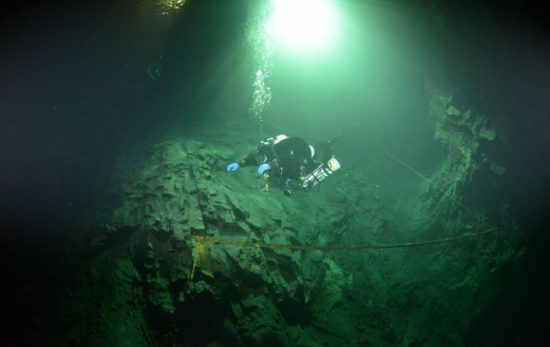 Once we dropped about 3 ft / 1m through that layer the visibility opened up to 50 ft/15m+, just quite a bit darker. 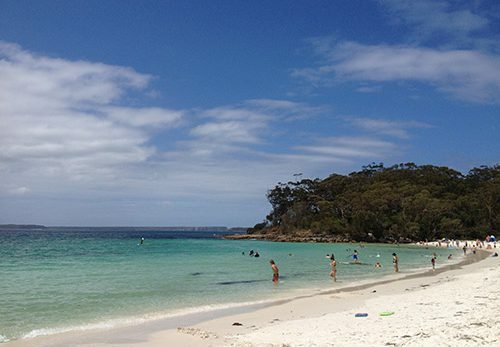 Below us were tangled broken tree limbs that we swam over, around and through. Because of the lack of oxygen in this acid layer, leaves that have been here for many weeks are just as green as they were when they first fell into the water. This was also an eerie experience because of the great visibility mixed with the low light and swimming around a wasteland of broken trees and limbs. Since we were now at 115 ft /35 m our no-deco time started to run out, so with five minutes left we grouped back up, holding each others hands and forming a circle, and ascended back up through the layer. Once back above the layer we swam around the tree limbs and watched as other divers’ bubbles came up through the layer we just ascended through. This made it look like heat from a fire rising upwards, since the bubbles were disrupting the layers of water and acid. 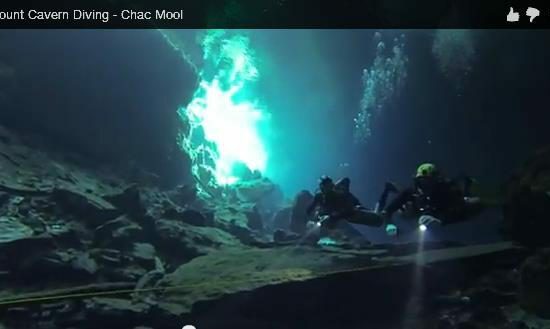 As more divers came up from the bottom, the water and acid layers began to mix making it look even more like a flowing river. Once our no-deco hit 5 minutes at this shallower area we started our slow ascent around the edge of the sink hole. The sink hole is made up of limestone so the walls were very porous with shades of black and white running throughout. This was by far the most unique dive I’ve ever done. If you’re looking for a new place to dive or a new type of diving, give cenote diving a try in the Riviera Maya. 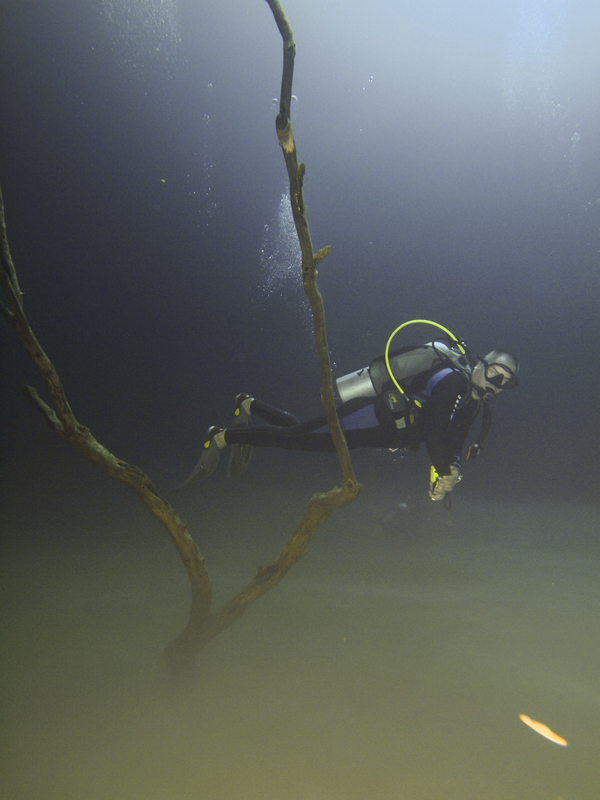 This dive at Angelita was followed by a dive at Cenote Carwash which had stalactites hanging from the ceiling and stalagmites rising from the floor and visibility was in the 100’s of feet! 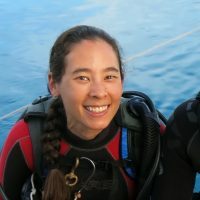 Follow Chris’ ongoing scuba adventures as he writes about them for The Dive Shack Tides (a blog for PADI Dive Center The Dive Shack in El Cajon, CA, USA). 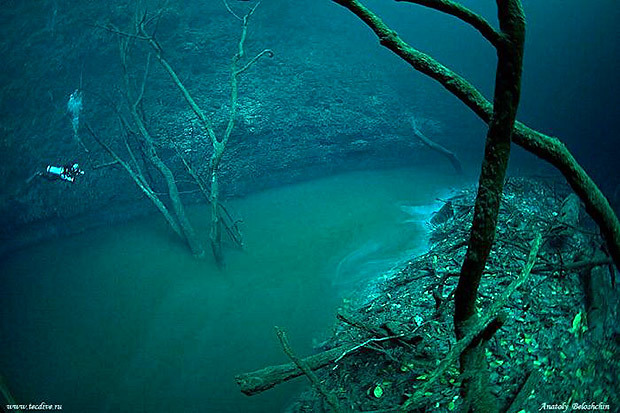 Read more about scuba diving cenotes in Mexico or find a PADI Dive Shop in the area.